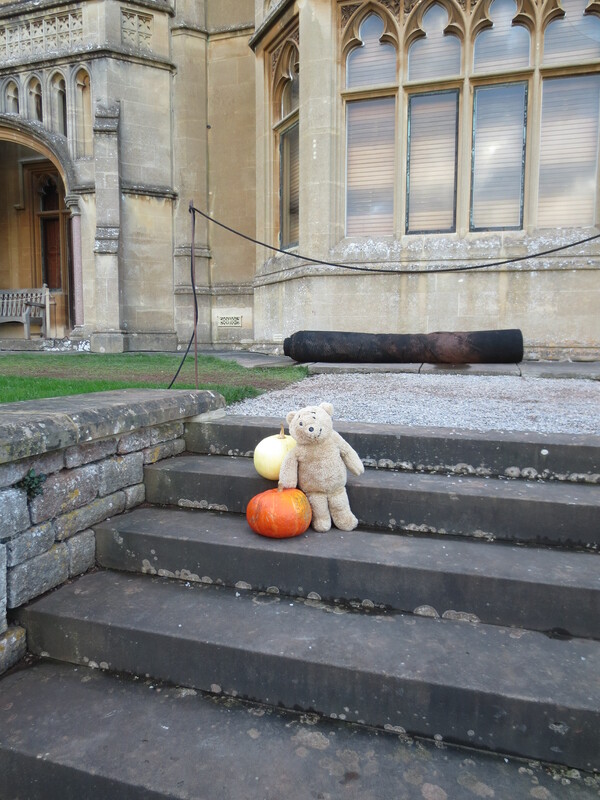 A couple of weeks ago my humans took me along to one of my favourite places for a Sunday afternoon outing, National Trust Tyntesfield. 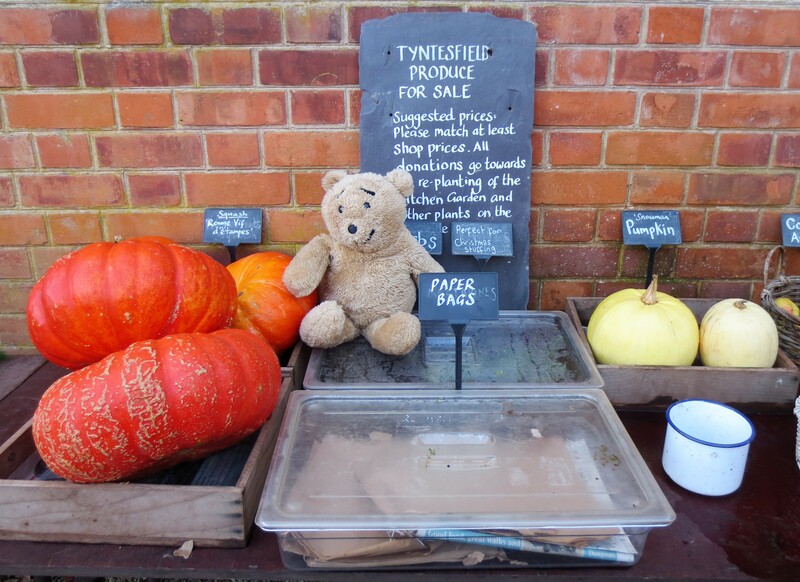 I always like to have a look at the produce for sale table that is outside the walled garden. 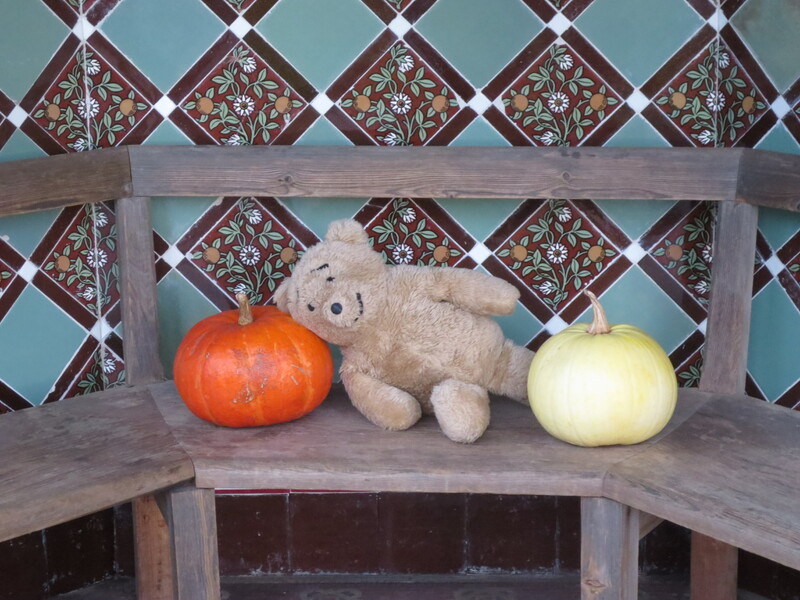 On this occasion there were some squashes and pumpkins needing a good home. 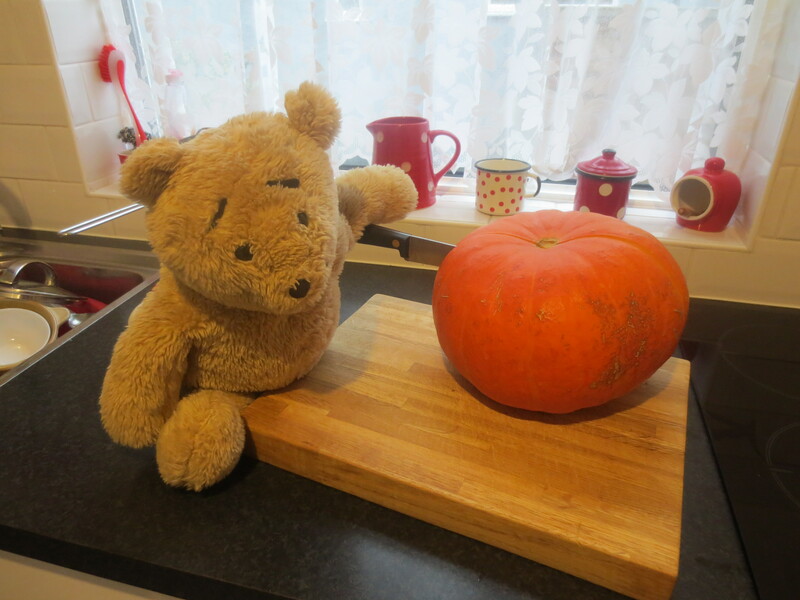 I managed to persuade my humans to buy the smallest squash (the one my arm is resting on in the photo) and the biggest pumpkin. We then had to carry them back to the car park. 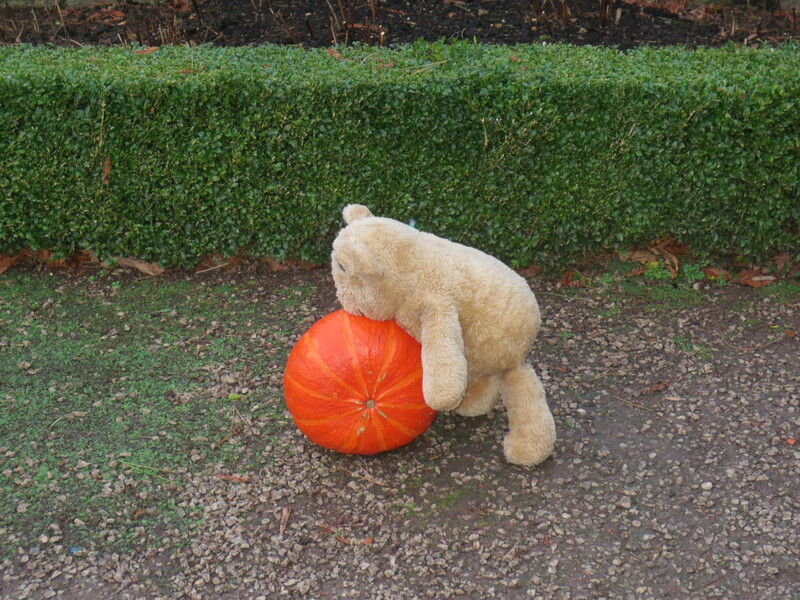 Carrying a pumpkin and a squash is hard work for a little bear like me (though my humans did give me a helping hand from time to time). I had to stop and rest frequently. I decided it would be easier to roll the squash along the ground, but my little legs became more and more tired. I really needed to have a little nap as transporting large vegetables is such hard work. 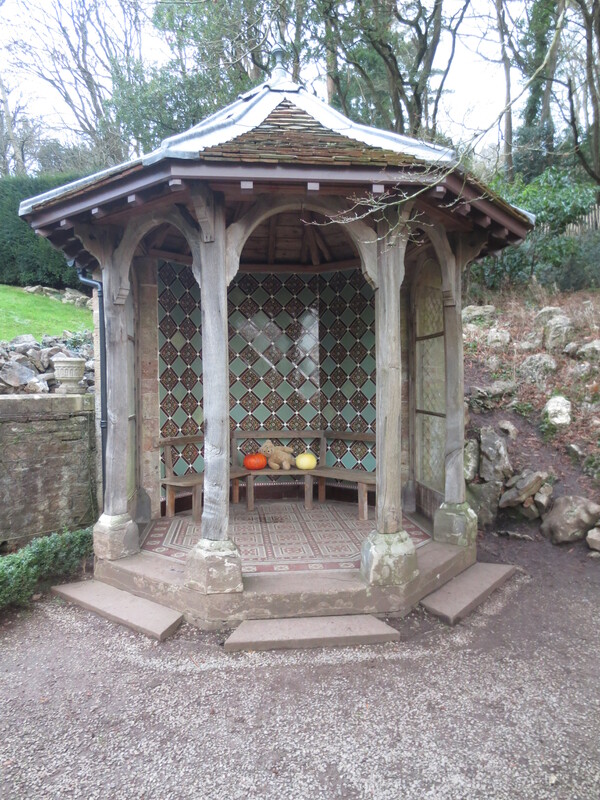 I was pleased to find a suitable little house in the rose garden. I climbed up onto the bench and dozed for a while, and the humans were happy to wait for me as it had begun to rain. Once the rain had stopped we continued on our way. 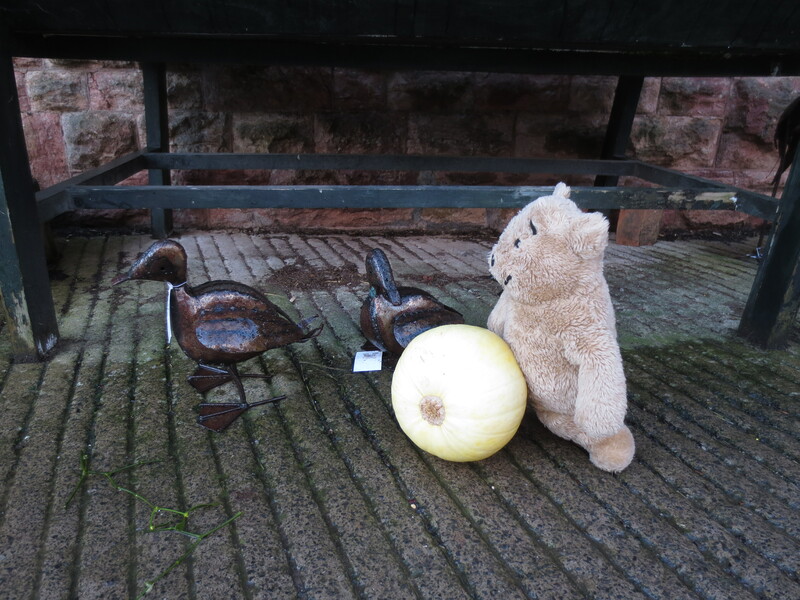 Some metallic ducks gave me strange looks as I pushed the pumpkin out of the shop area towards the car park. When we finally got them home my humans put them in the pantry for ‘later use’. 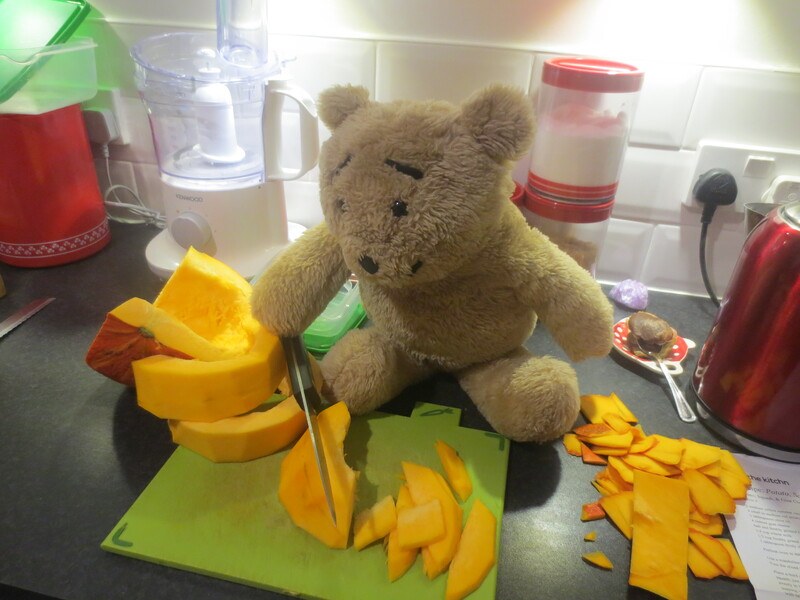 Yesterday I finally got to create something tasty using some of the squash; it is too big to all be eaten at once. First of all I cut it in half and removed all the pithy bits and seeds, then set to work cutting it into slices. 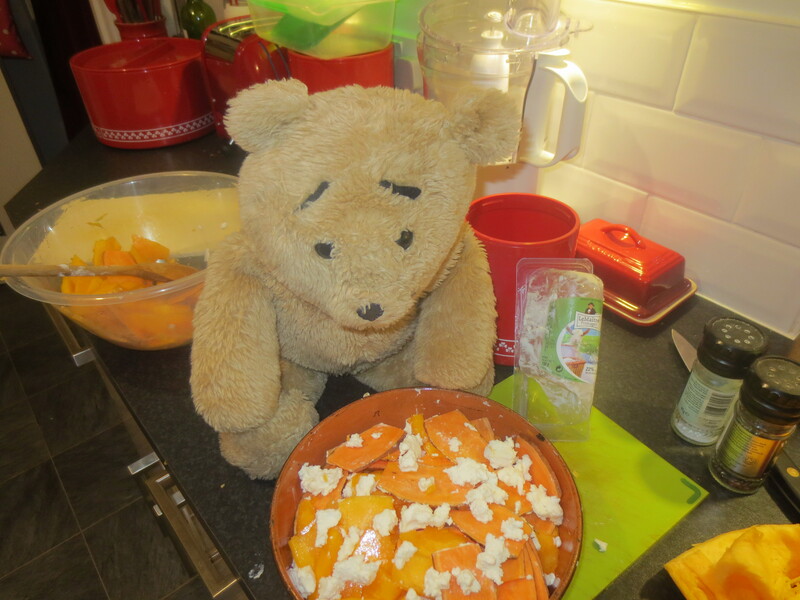 I removed the skin and then had to slice the squash into thin strips as I was making a ‘squash & sweet potato goat’s cheese gratin’. 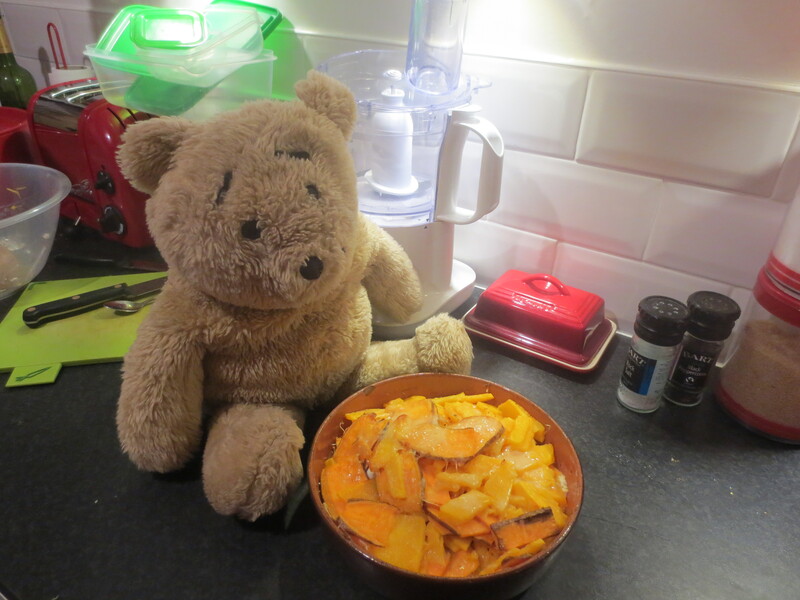 I mixed it all up with sliced sweet potato and olive oil then put a third of the mixture in the cooking pot, where I added some black pepper and salt to make it extra tasty. The next stage was to crumble some goat’s cheese all over the layer, but Karen did this for me as the cheese would have made my paws very messy indeed. Once all the layers were finished grated parmesan cheese all over the top. 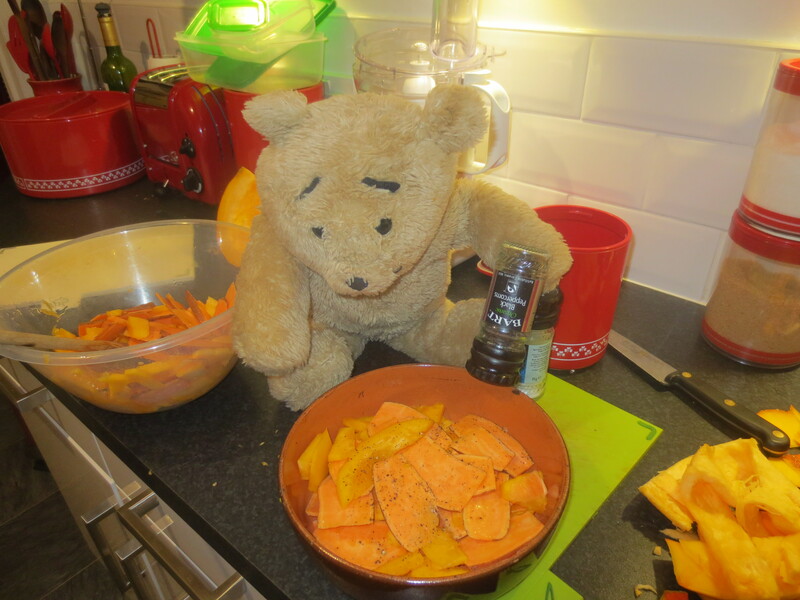 I like cooking with parmesan cheese as it doesn’t stick in my fur and not much of it is needed to add flavour. I popped it into the oven and cooked it for 45 minutes, and it came out looking very tasty indeed. However, on eating we found that it was a little under cooked, so if you try this at home perhaps cook it for an hour! 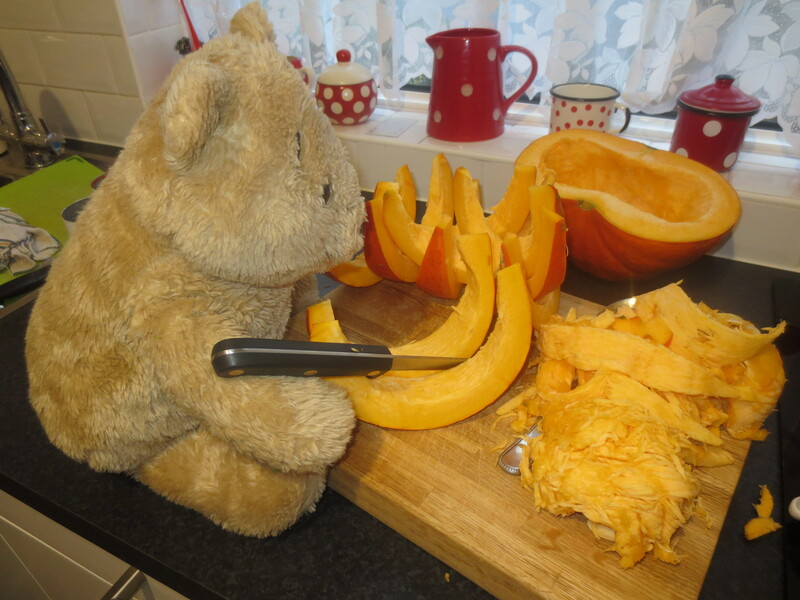 There is still lots of squash left, I think I might make the rest into soup, and as for the pumpkin, my little brother Nye would like to help me make a pumpkin pie. We’ll see…..